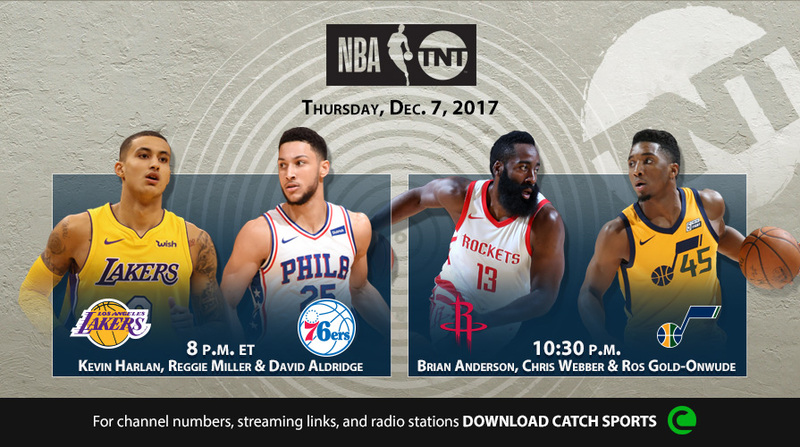 Thursday's NBA on TNT regular season doubleheader coverage will be highlighted by a matchup between October/November's Kia Rookies of the Month when the Los Angeles Lakers and Kyle Kuzma visit the Philadelphia 76ers and Ben Simmons on Thursday, Dec. 7, at 8 p.m. ET. The network's live game coverage will also feature the high-powered Houston Rockets and James Harden taking on the Utah Jazz and rookie standout Donovan Mitchell, coming off of Friday's 41-point effort, at 10:30 p.m. The network's live game schedule and telecast notes follow. Click on the below image for a video preview of Thursday's doubleheader. • Throughout Thursday's TNT coverage, Kevin Garnett will be joined by rapper, songwriter, actor and record producer Big Boi and former NBA standouts Rasheed Wallace, Rod Strickland and Tony Delk on Area 21. Select Area 21 segments will air on TNT, with additional content running on Facebook and Twitter. • Studio coverage from the iconic Inside the NBA team will be led by Ernie Johnson, along with Charles Barkley, Kenny Smith and Shaquille O'Neal throughout the night. • In Thursday's opening game – Lakers vs. 76ers – two of the league's youngest teams will meet at 8 p.m. ET, featuring dynamic big man Joel Embiid and rookie point guard Lonzo Ball. • In Thursday's nightcap, the Rockets and Harden will visit the Jazz and Mitchell at 10:30 p.m.
• Live streaming coverage of all NBA on TNT games is available via http://www.tntdrama.com/watchtnt and the Watch TNT app. Fans are able to access the games whenever and wherever they desire by logging in with the user name and password provided by their TV service provider.